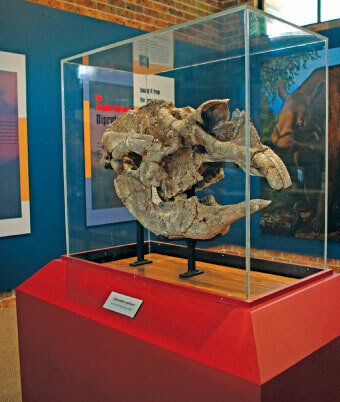 The Visitor Information and Exhibition Centre at Coonabarabran hold a priceless treasure, one of the finest Diprotodon specimens found in eastern Australia. 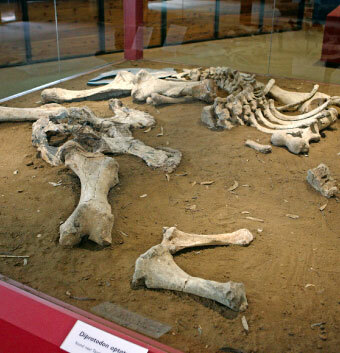 The Diprotodon was the largest known marsupial roaming Australia during the last two million years and may have become extinct as recently as 20,000 years ago or even later. 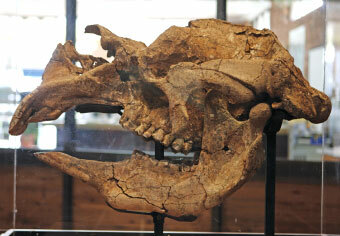 The specimen consists of a skull and most of the skeleton which was excavated at Tambar Springs near Coonabarabran. Diprotodon (meaning two-front-teeth) was described by Sir Richard Owen, a 19th century English anatomist, from bones and teeth discovered in eastern Australia and sent to him for study. The Diprotodon was a solidly built plant eater about the size of a large rhinoceros, with powerful teeth adapted for cropping and grinding vegetation. It is distantly related to koalas, wombats and kangaroos and can be traced back nearly 30 million years to small ancestral forms whose bones have been found near Lake Eyre in South Australia. Diprotodon was probably the last of the Diprotodontids but some of its relatives (Zygomaturus and Nototherium) also survived into comparatively recent times. Living with these Diprotodontids were giant, short-faced, browsing kangaroos (Procoptodon and Sthenurus), wombats the size of a large pig (Phascolonus), goannas up to seven metres long (Megalania), strange horned turtles (Meiolania) and flightless birds (Dromornis, Genyornis) considerably larger than the present emu. In September 1979 Louise Friis of Tambar Springs in northern New South Wales, discovered a large fossilized skull in the banks of Coxs Creek. Museum palaeontologists Dr Alex Ritchie and Mr R. Jones carried out an emergency dig to recover the skull and returned later with a team of helpers to excavate the rest of the skeleton buried deeper in the creek bank. After the overlying soil had been removed by pick and shovel the team used more delicate probes and brushes to uncover the bones. These were carefully cleaned before being encased in a plaster jacket formed by soaking strips of hessian in plaster-of-paris. This technique enabled scientists to recover and transport large and fragile fossil specimens to the Australian Museum laboratory for the delicate task of cleaning and strengthening the bones. The skeleton had been slightly disarranged before burial. Most of the overturned rib-cage was still attached to a long section of the backbone. The massive shoulder blades and various limb bones were uncovered nearby. From charcoal evidence found at the site, Professor Wright and Mr P. Gorecki of the University of Sydney were able to estimate by radiocarbon dating that this Diprotodon lived at least 33,500 years ago. How do animal fossils form? Fossils are rare and require a particular set of circumstances to form. The animal needs to be buried quickly after death for example - sinks into the silt of a muddy lake. Sediment covers the remains so no scavengers can destroy the carcass which then rots leaving the bones and teeth. Over time the voids in the animal's bones are replaced by water infused with minerals and the minerals settle in the vacant space. As the bones decay the minerals fill the resulting cavities. Eventually all that is left is a rock replica of the original bone. There is an intriguing human connection to this animal which you can investigate at the exhibition centre. You can also admire a mural that was painted on-site by internationally renowned wildlife artist Peter Schouten, a staff member of the Australian Museum. 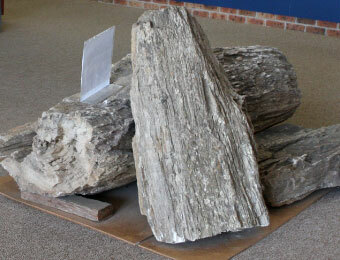 There are also numerous story boards and other interesting fossils including a portion of petrified tree trunk. The exhibition is on long term loan from the Australian Museum which has a policy of returning artefacts to their original location provided strict guidelines are followed. You will find the Visitor Information and Exhibition Centre on the Newell Highway at Coonabarabran. The centre is open from 9am - 5pm daily (except Christmas Day) Phone (02)6849 2144.